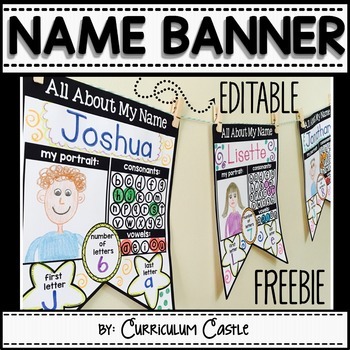 Add a very personal touch to your classroom with our student names banner. There are two versions in this file: English "All About My Name" and Spanish "Todo Sobre Mi Nombre". Directions on how to customize this editable file are also included. Perfect for Back to School and Open House displays! You must open this file in Adobe Reader to edit the PDF. Adobe Reader is most likely already installed on your computer. If you do not have it, a link has been included in this file. http://www.teacherspayteachers.com/Store/Curriculum-Castle by Yvette Florez and Jessica Ruiz. As such, it is for use in one classroom only. This item is also bound by copyright laws and redistributing, editing, selling, or posting this item (or any part thereof) on the Internet are all strictly prohibited without first gaining permission from the author. Violations are subject to the penalties of the Digital Millennium Copyright Act."